Living Legends: Bound by Wishes Collector's Edition is a new release into the Living Legends series from 4Friends Games. It is a game that will take you to a far away land in a different time, but the drama and emotions brought about by the story will be very real and engaging. The game's scenes are beautifully drawn with this sweet fairytale style for locations and characters. The price is to be paid to the mayor that promises to fulfil any dream.The trick is that even dying does not free you from the debt. When your husband didn't return for a few days after he's gone to settle his debt with the mayor, you set out to Wishville. This is when you discover about the strange roses killing the citizens. Not only that but you have to help some of the spirits kept in the town by theri debt. Helping them will help you understand what's going on in the town, where the curse came from, and how to help your husband avoing this terrible fate. 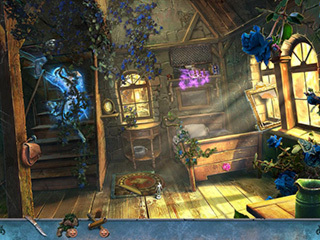 The game's scenes are beautifully drawn with this sweet fairytale style for locations and characters. The music and voice overs are pretty good and fitting with the story. The game's four difficulty modes are Casual, Advanced, Expert, and Custom. You can adjust your hints (10-200 seconds) and skips (30-400 seconds). 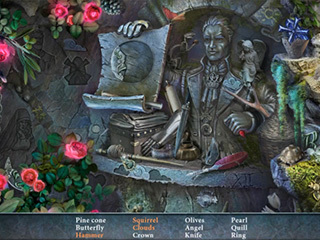 The hidden object scenes are different in their search types: lists, story type with BOLD letters, several of one kind of something, and placing back. A lot of what you know from the genre. The puzzles seem to be quite easy, so you might want to adjust the difficulty settings just a little bit up. There are collectible roses and morphing objects (25 of each). The challenge grows with 21 achievements in addition to the main game. The extras also include the usual media like wallpaper, music, art. 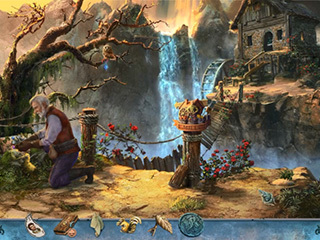 It is a sweet hidden object puzzle adventure game with a lot of chrm to it. This is Living Legends: Bound by Wishes review. Download this game here.